Limo Hire Perth Vintage Limousine hire for Perth Weddings, Perth School Balls and Social Events. Leading Perth Limo Hire with Wedding Limousines and (Limo Hire) all around Perth. We offer Vintage Limos or Vintage Limousines for Perth Weddings, Perth School Ball Hire and Perth Social Occasions. NOW with matching 11 & 12 passenger Limousines we can transport groups up to 23 passengers. Pamper yourself and your friends with a stretch limousine experience that turns every journey into a special occasion. Enjoy spacious seating and head room that relaxes you or gets the party going... Feel the luxury of real leather limousine upholstery, ease into air conditioned comfort. Sit back and listen to a top quality sound system that puts you in the mood. Our Perth limo hire services have it all. Take time to surround yourself and friends in stylish glamour as you are transported in one of our Perth limousines from Scenic Tours, Weddings or School Balls. ​PERTH WEDDINGS - Are you looking to hire a Vintage or a Classic vehicle? For your up coming Wedding / Perth Limo Hire? You will find with most vintage wedding car companies, they can only seat from 3-7 passengers per vehicle. Other companies quote a minimum 3 hours making two vehicles more expensive. Our Vintage Classic 1928 Ford Limousine has seating capacity of 11 passengers. This allows enough seating for the whole bridal party. We find that 90% of weddings used the same limousine to drop the boys of a little early before returning with the girls. This can save you a large amount on your wedding limo hire. PERTH SCHOOL BALLS - Stand out from your friends in our 1928 Ford Limousine. Gather a group of up to 11 passengers. Pricing between $40-$100 per person. Perth Limo Hire will help make your Perth School Ball Limo Hire special. We supplied non alcoholic champagne to get the party started. Play your own tunes with a Aux stereo plug. Photos with the limo look amazing. Call Rob and Kate now on 9398 9175 or 042 888 1975. 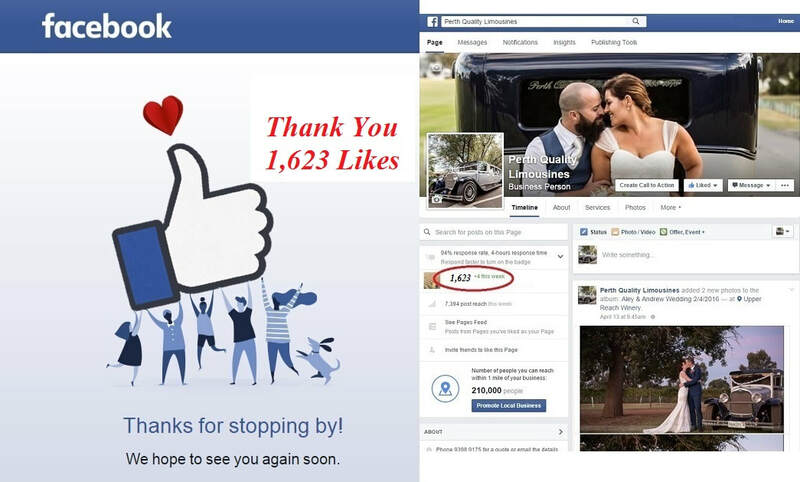 Perth Limousine owners who believe in service beyond expectation!